LIC Jeevan Umang (T-845) is a versatile, ‘with profit whole life plan’ which has several benefits of erst while popular plan Jeevan Tharang (T 178). The greatest advantage of LIC Jeevan Umang is that it offers a ‘Guaranteed Pension’ and ‘Insurance’ to the policy holder and that too with out any tax liability on pension amount. LIC offers guaranteed annual survival benefits at the rate of 8% of Sum Assured after premium paying term which is followed by maturity benefit at 100 years of age. Final Additional Bonus paid at maturity. Click the links given above to open calculators. LIC’s Jeevan Umang is a non- linked, with profit whole life assurance plan. Which means that, it is not directly linked to share market and insurance coverage is available through out the life. As it is a with profit plan, it will be eligible for bonus declared by LIC at the time of maturity. Premium paying term can be selected from 15, 20, 25 and 30 years. Guaranteed survival benefits at the rate of 8% of Sum Assured will be available annually after completion of the premium paying term till maturity or death which ever is earlier. Death benefit equal to Sum Assured + Bonus + final additional bonus available through out life. Maturity benefit at the age of 100 includes Sum Assured + Bonus + Final Additional Bonus. Simple Reversionary Bonus for Jeevan Umang is available only up to premium paying term. After that, bonus rate for the plan will be at a special Differential Rate (DB-Differential Bonus). Income tax rebate u/s 80C is available for the premium paid.You can use this Online Income Tax Calculator to calculate your income liability. Maturity benefit and guaranteed survival benefit (@ 8% of SA ) is exempted from income tax liability u/s 10(10d) of Income tax act. Five Unique Features of LIC’s Jeevan Umang which you may not know..
Top 5 best ELSS Tax Saving Mutual Funds to Invest in 2017 -2018. Jeevan Umang – Calculator is a powerful online tool which can help you to get a complete idea on the premium and benefits of LIC’s newly introduced whole life pension plan – Jeevan Umang. LIC Jeevan Umang policy T-845- Example of benefits. In order to get a clear idea on the benefits of LIC’s Jeevan Umang plan, let us take an example of a person with following details and assume that he is taking a new policy. Please note: Illustration shown here is just an example to understand the benefits of Jeevan Umang Policy, If you want to know the actual benefits as per your details, please use the Jeevan Umang Calculator provided above. Likely possibilities after taking Jeevan Umang plan as per our example are..
Let us have a look at these scenarios one by one. Guaranteed survival benefits of Rs.80,000 per annum shall be payable yearly for next 50 years as the policy holder will be at the age of 50 years at the end of premium paying term. If the policy holder survives up to the age of 100 he will be eligible for a benefit of Sum Assured + Bonus +Final Addition bonus. In our case he is eligible for a return of Rs.48,00,000 at expected rates of bonus of Rs 50 per thousand SA. In case of an unfortunate event of death occurring due to an accident, additional benefits are payable, if and only if the optional accident benefit rider is taken at the time of policy. Two types of accident benefit riders are available under Jeevan Umang policy. If death occurs due to an accident an additional sum assured will be paid. Premium required for this rider is Rs .50 per thousand accident coverage opted for. LIC’s Accidental death and disability benefit rider. Here accidental death coverage of additional Sum Assured will be available in case accidental death. Survival benefit at the rate of 10% of Sum Assured shall be payable in case of an accidental disability. 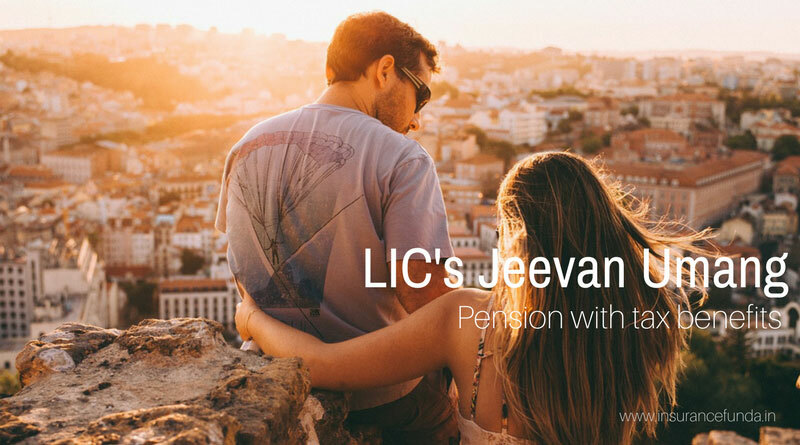 Read more: Five Unique Features of LIC’s Jeevan Umang which you may not know..
New Jeevan Anand (T-815 ) a critical review and comparison with other plans. *The benefit illustrations shown above are just for understanding the basic details of the plan. Please go through LIC web site for more details. LIC Jeevan Umang is considered similar to LIC’s Jeevan Tharang and bonus rates shown are of Jeevan Tharang plan. Actual benefits can vary based on real situations. Simple Reversionary Bonus for Jeevan Umang is available only up to premium paying term. After that, bonus rate available will be at a special differential rate (DB-Differential Bonus).